Put your life in order with this valuable new resource from AARP and the American Bar Association. 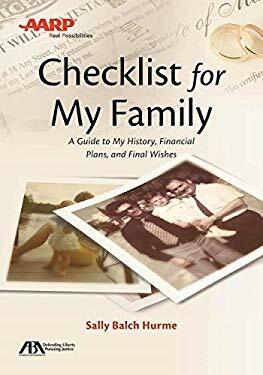 Checklist for My Family guides you through the process of gathering in one place your finances, legal documents, online accounts, wishes about medical care, and more. Plus it tells you what you need, why you need it, what s missing, and where to get it. While giving you peace of mind, this book is also a gift to your loved ones. It spares them stressful decisions and needless frustrations when you re ill or upon your death. And it presents them with your legacy, by providing specific knowledge of family history and recollections about your life, interests, and accomplishments. Whether you choose to gather this critical information in the book itself or through the forms available free online, you can easily customize and organize your information. With this one-of-a-kind guide, you ll stay in control of your life and feel satisfied in knowing that if anything happens to you, you and your family will be well prepared." New (165 available) BRAND NEW. Over 1.5 million happy customers. 100% money-back guarantee. Make your purchase count: support Better World Books' worldwide literacy partners.